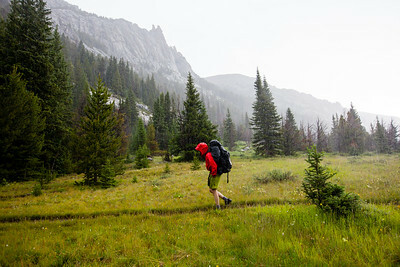 Not ten minutes into the trail and suddenly we were forced to retreat into our rain coats. Then, to further impede our progress, lightning flash and thunder strikes right over our heads pushed us to find some shelter amongst the sparse clumps of standing trees. In 2008, the human ignited Cascade fire ripped through here burning over 10,000 acres. Charred bits still peak through the foliage that has since grown back and we have plenty of time to ponder the lightning over our head and the fire it can cause as we wait for the storm to pass. Sixty percent of the fires in the Beartooths are caused by lightning strike. Eventually, the lightning ceases, but the rain does not. Two and a half miles later we reach camp, set up our tents in the rain and wait. Our objective of this adventure was a mountaineering style climb up a long strip of snow tucked into a slot on the North face of its namesake Whitetail Peak in Montana’s Beartooth Mountains. Our brand new Mystery Ranch packs were stuffed with mountaineering gear like boots, crampons, harnesses and strapped on the outside our mountain axes, helmets and ropes made our objective obvious. But nobody got the clue. We were the only ones out there tromping through the rain. When the rain finally stopped the clouds cleared and we got our first glimpse of Whitetail. It was still white, but even from our vantage nearly 3.5 miles away it looked thin. We stared at it for a while speculating what tomorrow would bring. Since our hiking shoes were soaked from the hike in, most of us changed into our mountaineering boots to clomp around camp and let our shoes dry by the fire. As we made dinner, two other climbers passed by our camp. They were looking to climb up Whitetail as well. After hunkering down in the rain and scoping out the route, they packed up and were heading out. They confirmed our fears saying the snow was all rotted out and a free flowing waterfall was cascading down on and under the snow. We still held hope until the third and final blow struck the next morning. As I woke, I knew we weren’t going. The whipping of the nylon shell that is our tent told me. I knew we were only getting a fraction of the wind where we camped in the valley compared to what was likely happening on the peaks 4,000 feet above us. Unwilling to let the weather sour our moods or keep us from getting some sweet views, we packed water, lunch and rain jackets. We left our heavy mountaineering gear in our tents and headed towards Whitetail. We knew we weren’t going to climb the ice and snow, or make it to the summit for that matter. But even with the wind whipping around us, the sun was out, the air was warm and we were surrounded by the beauty that draws most mountaineers to the mountains in the first place. Getting closer to Whitetail we could see it truly was in horrible condition for climbing. Instead we hiked the five miles up to neighboring Sundance Pass, had our lunch, Tweeted an update on the Iridium Go and headed back to camp for dinner. 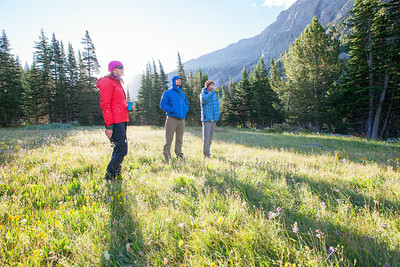 On Sundance Pass 10,928' w @TheMysteryRanch @TheGearCaster @PRBvincent #SatoriExpeditions in beautiful Montana. A touch windy. Sure, we were disappointed but spirits remained high. We’ve all had to adjust climbing plans before and all had enough mountaineering experience to know we made the right choice. The views from Sundance Pass down into the two valleys it connects as well as across many of the peaks surrounding us was still incredible even after having a fire come through. In this day and age of social media, trips like this don’t really exist until you document them, right? Hence, I brought along my GoPro Hero 3 Black attached to the iStablizer extension wand. Since batteries go fast, the Goal Zero Venture 30 kept the camera and my iPhone (completely protected from the elements in a Lifeproof case) charged up. If needed, it could also juice up my Suunto Ambit 2 GPS watch and the Iridium Go satellite communicator. 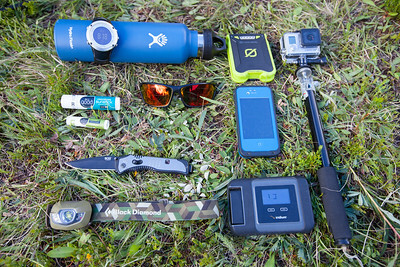 Knives are a must in the backcountry and the SOG Flashback is a favorite. Also shown: Black Diamond Spot Headlamp, V12 Optic Nerve Sunglasses, insulated bottle from Hydroflask and sunscreen & lipbalm from All Good. This entry is filed under: Blog, Earth, Hike, North America, Photography, Story, Video.